Hey friends, sorry for the silence. I’ve been busy working, resting, etc. I have also been thinking a bit about Theological Education. And I wanted to share those things and hear your thoughts. I’m sure that Theological Education can go wrong in more ways that what I’m about to share, but I have three that I’ve been reflecting on. We could unpack these significantly, but I just want to draw some attention to them. First, when Theological Education is disconnected from the HEART, it fails. When the glorious truths of the Living God are spoken of with the same level of academic disinterest as a biologist speaking about spores, we’re lost. I recently heard someone summarize Thomas Goodwin’s philosophy of preaching like this: “Communicating God’s Heart (that’s the content) to the Hearts of the congregation (that’s the target) from the Heart (that’s the preacher).” I love that. And if that’s true, then Theological Education is “Studying the Heart of God.” This is often why we get the Seminary and Cemetery jokes. Why many leave the faith when they leave seminary. What if our graduates left class with their hearts aflame for God? What difference would that make in the Church and on the mission field!?!? So, theological educators must delight in God and raise up pastors and scholars who do likewise. Theological institutions must be JOY FACTORIES! Second, when Theological Education is disconnected from the CHURCH, it fails. We know this when pastors come into the pulpit to argue some theological minutiae and his flock goes home starving. This is NOT arguing pragmatism. I’m NOT saying that only practical theology and ministry courses matter. But I am saying that whatever our topic/class, if I’m not studying it with an eye towards the people of God, then I won’t know what to do with it afterwards. I’m left writing monographs on 2nd Temple Judaism’s understanding of how to lay bricks OR the sexual practices of temple priests in the Roman world. When our students say, “I don’t need to go to church because I’m in class all the time” or “I go to Chapel,” it shows how thin our Ecclesiology is, and we can begin lamenting now for the future of God’s people. Some institutions are denominational, and this can help keep a connection with the local church, but being a part of the same denomination doesn’t necessarily mean your training pastors and scholars FOR that denomination. You may simply be running programs that look like everyone else’s, with no reference to the local church. Some institutions are interdenominational, and in that case, I think you need to work even harder to have some sort of commitment to and for the local church. And professors can’t be free agents, independent academics, but must be churchmen. The blood of Christ was poured out to purchase the Church; therefore, that MUST be the raison d’être of every theological institution. Third, when Theological Education is disconnect from the MISSION of God, it fails. My very first class in seminary was Greek I. The first words out of the mouth of my professor, Dr. Ed Keazirian were these: You are here to learn Greek so that you can help fulfill the great commission and for no other reason. He later said that knowing Greek was like wearing underwear…you should always have it on, but never have it showing! The BEST theology in history flowed out of the missional intersection of the Gospel with false teachings. Whether it’s the early church’s external struggles against Roman philosophy or internal struggles against Arianism, Gnosticism, etc. the great theological work of the early church was articulating God’s truth over and against the false gospels and gods of the world. In the Reformation, we see the same; namely, the clarity of the Gospel proclaimed in opposition to false Catholic dogma. The two richest theological seasons of Church history are that way BECAUSE the leaders of the church were missional theologians. I heard Michael Reeves define theology from Judges 6 and the story of Gideon. God told Gideon to destroy the altar of Baal and the Asherah and to replace them with an altar to the true God. Reeves says that’s theology! Destroying false belief and replacing it with true faith! Instead of being seen as safely removed from society for the sake of leisurely study in quiet and isolation, perhaps theological institutions should see themselves more like a boxing gym…preparing fighters for the day when the Devil takes his gloves off and comes for their congregation. How else does Theological Education go wrong? What should look different if these things are true? What institutions are doing a good job at these things, and how? We saw in our previous posts in this series (1, 2, 3) that what we believe about God, his character, his heart towards us, shapes everything else in our life and faith. In this post, because of that, let’s draw our eyes towards the Lord and see what He is really like. Let’s see what he thinks about you. Is He just putting up with us, tolerating us? Is he just watching from Heaven, waiting to jump on us after every little mistake? Let’s find out. How do we know what God is like? 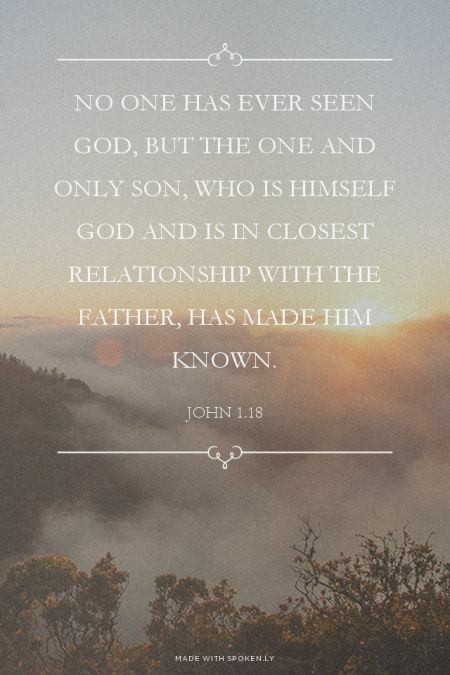 John 1:18 tells us: “No one has ever seen God; the only God, who is at the Father’s side, he has made him known.” So, how do we know what God the Father is like? Jesus reveals Him! We cannot know God apart from Jesus. He is the exact representation of His nature. That is a very important point for us. If you try to imagine God without Jesus, you are thinking of an idol. LET ME SAY THAT AGAIN. If you try to imagine God without Jesus, you are thinking of an idol. Michael Ramsey, former archbishop of Canterbury, put it this way, “God is Christlike, and in Him there is no unchristlikeness at all.” God is Jesus-shaped! In fact, let’s start to use that title “God” a lot less. Instead, let’s talk about our loving Father and our brother and husband, Jesus, who has come to save us, and the Holy Spirit who makes all of the Father’s promises, which are YES in Jesus, true for us! So, if we want to know what the Father thinks of us, and how he feels about us, how he is towards…we look to Jesus. And that’s just what we’re going to do in the next post. What is God’s Glory and Why does it Matter? Last year, I read Michael Reeves’ wonderful little book Delighting in the Trinity. In it, he spends just a few pages showing how the Trinity, particularly the love between the Father, Son, and Holy Spirit, shapes our doctrine of God, including the attributes of God like Holiness, Wrath, and Glory. I want to focus some thoughts, reflections on the last one: GLORY. Very briefly, he declares that God’s glory is His outgoing love. THAT is what God’s glory IS. This was new to me. To my shame, I must admit that I’ve never taken on God’s glory as an object of study. Nor was it covered in any particularly way during my time in seminary. Like many younger reformed evangelicals, I’ve always looked to John Piper for an explanation of God’s glory and why it matters, but what Reeves was saying was a departure, at least in part, from Piper’s approach. I wanted to know more. But, where to turn? I’ve listened to many of Reeves’ sermons since then. I have found several where he introduces this idea again, but in most of them, he doesn’t cover much more ground on this issue. There is one workshop called Matters of the Heart: How to Enjoy God where Reeves unpacks it further, with the assistance of Jonathan Edwards. It may be a good place to get a first look at what I’m talking about. That brings me to the real point of this post. Glen Scrivener has taken up the idea (I don’t know if he got it from Reeves or vice versa or some other way) and helpfully interacted with it quite a bit. So, the rest of this post will be a bit of an annotated Bibliography of Scrivener’s Doctrine of God’s Glory. Wind the clock back all the way through time, before creation, back and back and back into the depths of eternity and you will find Jesus with His Father loving and serving each other in the power of the Spirit. That’s what the trinity has ALWAYS been up to. That IS the eternal life of God. So on the cross, when we see Jesus giving Himself up to the Father we see the eternal glory of God. At the cross when we see the Father GIVING His Son to the world, we see the eternal glory of God. The cross IS God’s glory. And it’s the glory of infinite SELF-GIVING love. God’s glory is His grace. It is His very “Godness” to give Himself away to us and for us. You really should read/listen to the whole thing though. OK, so that brings us to a definition, but I wanted to interact more with this understanding of God’s glory, and there’s (thankfully) no shortage of this on Scrivener’s blog, including his posts and quite a bit of good interaction in the comments. So, the rest of this post is an attempt to give you an idea of how to explore this treasure. Well, Scrivener put together a little series of posts to wrestle through “what is God’s glory?” Not only is this little series named after a great song from the greatest decade of music, it’s also a great next step in the journey of discovering what God’s glory is all about. One of the questions that arises in this discussion is the nature of God’s love for us. Piper would say that God’s love for us is primarily seen in making it possible for us to love Him (therefore glorying Him). So there is a boomerang effect where the intention is that we would make much of God. Many have posited squirmy reactions to this, but it’s PIPER, so they don’t speak out for too long. But, I think this Reeves/Scrivener approach (“God’s glory is His grace” in the word of Jonathan Edwards) actually does greater service both to God’s fame and to his affection for his people. Scrivener interacts with this question in his God Loves God more than God Love Us? post. And just for fun, here’s a short, wonderful quote on Why God Love Us. In his post called Beginning with the Creator? Scrivener is super-helpful to show why the TRINITY must be the starting point for understanding God’s glory. And why starting anywhere else is detrimental/dangerous. Read it! You’ll thank me! For more on this topic, see his Oneness and Threeness post and his You and Me, We’re Not so Different Really post. So, how do I wrap up this tour through Scrivener’s writings on the glory of the Triune God? Well, I guess by saying that you should spend more time over at Christ the Truth. I may eventually do a similar post looking at his writings on Mission. But, I’ll also say that this understanding of Glory; namely that it is the outgoing love of God, that it is His grace, His cross…that it is the Gospel, which Paul calls the “knowledge of the glory of God in the face of Jesus,” changes things. Look at the overflowing love of God! Oh what a God we have! Oh, what a beautiful Father! Oh, what a glorious Son! Oh, what a majestic Spirit of overflowing love! Glory isn’t an abstract, glowing blob of awesomeness…it’s the love of God on the move! That changes everything!